Bright Young Things by Anna Godbersen. (Grades 7+) HarperCollins, October 2010. 400 pages. Review copy provided by publisher. It's 1929 in New York City and Prohibition's going strong, but the booze is flowing for those who know where to get it. Cordelia and Letty are running away from their stagnating lives in rural Ohio. Letty knows she's destined to be a star on the stage and Cordelia is convinced she can find her father, the bootlegging gangster Darius Grey. Astrid is delighted to spend the sultry summer in the company of her boyfriend Charlie, sipping champagne and dancing the night away. But nothing's certain in the summer of 1929 and each of the girls will meet challenges they never could have anticipated before the summer's out. Fans of Ms. Godbersen's Luxe series will be rabid for this one. This I know. And, really, what's not to like? Runaways, clandestine romances, gangsters, spectacular outfits, and all the alcohol you can drink! Plus, just look at it. That cover, following in the tradition of the Luxe covers, is eye-catching for sure. I have to admit that, for me, Bright Young Things didn't quite hold up to the Luxe series. There are definitely some things I loved about it, but I think this book wasn't quite as layered where the characters are concerned. In the Luxe books, I loved the relationships between all the characters. They were all part of the same social scene and they all interacted and bred drama on a daily basis. In Bright Young Things, the characters aren't as close to each other, so I missed those ever-changing alliances and betrayals. Also, there were a lot of secondary characters and they were a bit hard for me to keep straight, especially the guys. But I guess it's not really fair to compare the series and I only do it because the reason I was so looking forward to Bright Young Things is that I loved the Luxe books so much. Okay, there were some things I really liked about Bright Young Things. First of all, the setting. This is just what Ms. Godbersen's fans have come to expect - rich historical detail told in a very visual way. Her prose paints a picture of 1929 and the reader feels transported from New York City landmarks to speakeasies to the sweeping estates of Long Island. Secondly, gangsters. It's taken for granted that the society girls of Long Island can drink every night, but I just kept thinking to myself, "This is totally illegal! They are, like, real gangsters!" I dunno. For some reason, I found it delightful. And third, it's 1929. It's summer 1929. And while everyone's partying and necking and dancing, WE ALL KNOW WHAT'S ABOUT TO HAPPEN. It gives the book a wonderful feeling of just-you-wait and I have to admit that I'm incredibly anxious to know how everything's going to change once the stock market crashes. So, you know I'll be looking for the sequels. As will thousands of other rabid fans. Check out more reviews at The Story Siren, Lost in Stories, Words on Paper, and Literary Life (among others). 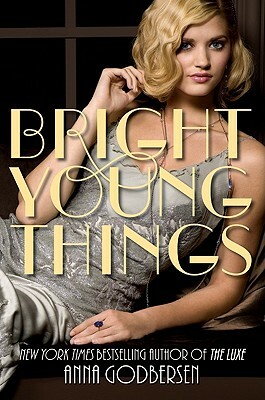 Bright Young Things is on shelves now!